Edit PDF Easily: Add Text, Insert Images, Draw Shapes, Remove PDF Text, Delete PDF Pages & Redact PDF Content. Win PDF Editor is a Windows PDF editing software product that lets you modify and edit PDF documents like adding text, insert images, removing unwanted content, drawing lines and rotating PDF pages. If you write text on the PDF, you can change the text font, size, color and move it to anywhere you want on the page. After inserting an image into PDF, you can resize the image and move it also. If you find some words or images need to be removed, simply use the eraser tool to erase. Better than other PDF Reader applications, Win PDF Editor can permanently save the edited PDF content changes in PDF. With "PDF Delete" and "Redact" functions, users are able to delete PDF pages and redact the confidential text from the PDF file. Add Text, Add Image, Pen, Brush, Eraser, Line, Rectangle, Ellipse, Color Selection, Copy to All Page, Page Rotation, Font Selection, Line Weight Selection, Page Delete & Redact Text. What Can Win PDF Editor Do? You can add images to the PDF and resize them. Win PDF Editor supports most popular image formats like JPG, PNG, GIF, BMP and TIF etc. It also keeps the image originally transparent. You can add your signature image to the PDF document and easy to sign now. The Copy To All Pages Tool allows you to copy the selected object to every page in the PDF. You can use this function to make an inserted image as a watermark for the PDF document. Win PDF Editor Converter can convert PDF documents to other editable formats like WORD(*.Doc), Text(*.txt), Images(*.JPG, *.TIF, *.BMP, *.GIF, *.PNG), Web page(*.HTML) or Flash(*.SWF). Win PDF Editor has the "PDF Redaction" function, which allows you to redact confidential text and black out the important content in PDF documents. Click on the "Page Delete" button on the toolbar will show you a small PDF Page Delete window, which can easily delete PDF pages from a PDF file. The "Highlight" tool will allow you to mark or highlight the important sentences and words, and you can set your favorite highlight color besides the default yellow highlight color. 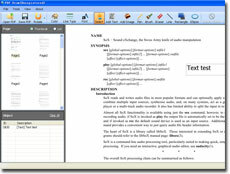 The PDF editor allows you to add and remove text on PDF. Remove unwanted content with the eraser tool. Its width can also be adjusted based on the type of content that will be deleted. Apart from this, adding text is also a perk. The inserted text can be placed anywhere on the file, with adjustments on the font style, font color, and font size. This PDF editing app allows you to delete unwanted pages. When editing, other pages are no longer required for the final output. Win PDF Editor allows users to delete pages that are deemed insignificant. A Page Delete is available on the toolbar, which leads to a PDF Page Delete Window. The PDF editor allows you to insert images. It supports the most used formats like PNG, JPG, TIF, and BMP so compatibility is not an issue. The software also ensures that the image remains transparent for tasks like adding a signature. This PDF editing program allows you to rotate pages at different degrees. Adding text or images needs to be done at different angles. Users can change the orientation of a page into 90, 180, and 270 degrees to make editing more convenient. Win PDF Editor allows you to redact confidential content. Some information may not be for public consumption and Win PDF Editor recognizes that. Thus, it allows writers to redact or black out particular data which needs to be protected. This PDF editing tool allows you to annotate and draw. Square, rectangle, circle. You name it, and Win PDF Editor has it. This program lets you draw shapes which are usually necessary when writing annotations. With this feature, converting into other editable formats to add annotations is no longer necessary. Win PDF Editor allows you to create watermarks. Watermarks are text or images that serve as backgrounds of pages. This is a mechanism to protect the document from intellectual property theft. This software allows watermarks to be customized and put on selected pages. Win PDF Editor allows you to permanently save edited content. After everything is according to what is intended by the writer, a feature to permanently save is an absolute need. The user has the option to use the same file and save the changes made or completely use another file name and retain the previous one. The PDF Converter allows you to convert to other editable formats. This software is not just an editor. It is also a converter. You can opt to save the final file as Word, Text, Images, or Webpage. With this feature, you won't have to download another program just to convert. Win PDF Editor allows you to highlight text. With tech advances, studying has been revolutionized. 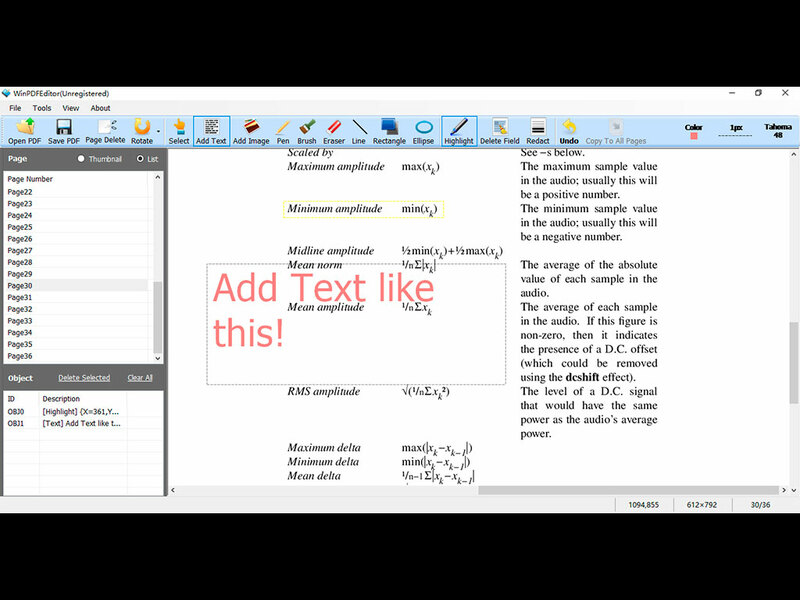 Win PDF Editor adapts to the modern ways of reviewing through the highlighting tool. Thus, the lectures and other academic materials are easier to understand without having to be printed. You can download this PDF Editor application now and experience the wonders of this product!